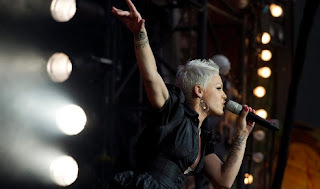 Famous American POP & rock singer, song writer Pink's official Facebook Page hacked. Her personal Facebook page was hacked over the holiday weekend, with the cyber ninjas taking aim at her personal photos, which further angered the singer, who gave birth to her first child, daughter Willow Sage, earlier this summer. Pink angrily tweeted, "To all the people I don't know hacking into my private pictures on Facebook, please stop. Have some respect for privacy." Pink later demonstrated some responsibility for her own actions, saying, "It's my own fault for posting a picture. I should know better. Anyways, there are way more important things in the world than my Facebook page." Amen. But still, it's gotta be frustrating to have your personal digital space invaded.